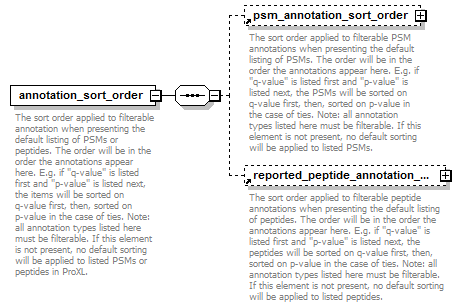 The sort order applied to filterable annotation when presenting the default listing of PSMs or peptides. The order will be in the order the annotations appear here. E.g. if "q-value" is listed first and "p-value" is listed next, the items will be sorted on q-value first, then, sorted on p-value in the case of ties. Note: all annotation types listed here must be filterable. If this element is not present, no default sorting will be applied to listed PSMs or peptides in ProXL.